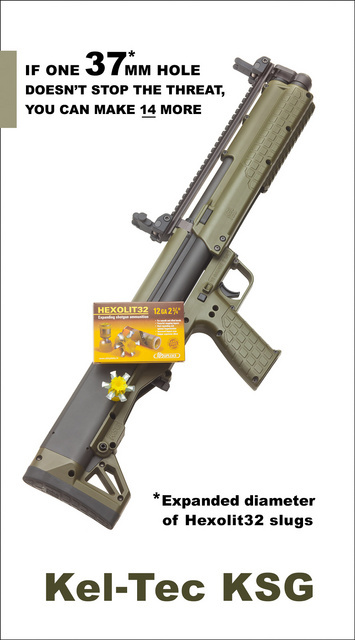 This entry was posted in ammunition, self-defense, weapon and tagged 12ga, bullpup, DDupleks, Kel-tec, shotgun, slug. Bookmark the permalink. Now THAT’s a home defense package. I try more to imagine how great it’d be to put a few rounds down range with a new gun when I see it but even I can’t help but think this would be a great weapon for a video game. Now, when the Latvians make 12-ga mini-shells with that flesh-shredding slug, the wymmen will go for Coach Guns in their thousands….the price of a good (Stoeger) Coach Gun is about the same as a cheap semi-auto, and less than most of the “lady” revolvers. If a guy has to pick it up, and happens to have some full-house loads, they go in the same gun. >>>KSG = Kills Serious Game?